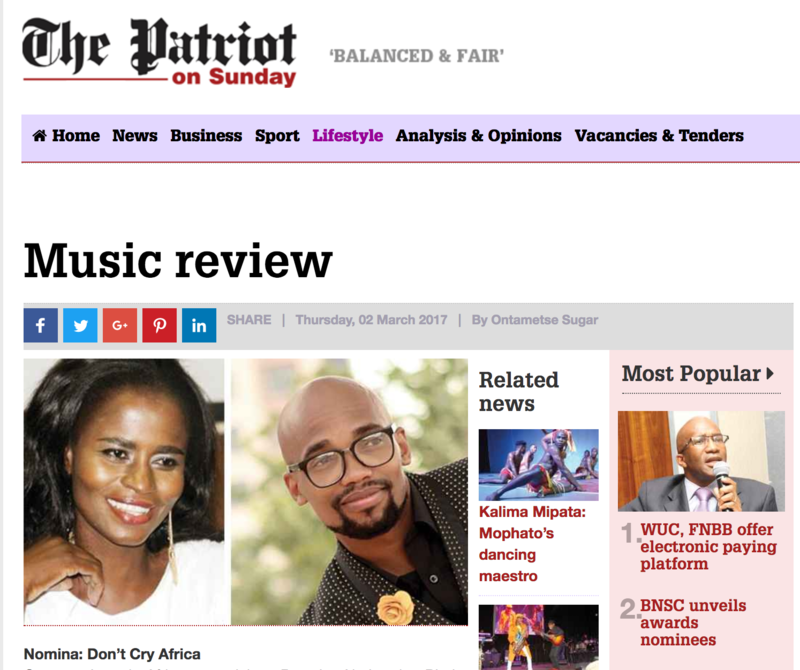 Germany-based African musician Pamela Nothando Bhulu, professionally known as Nomina, has just revealed her new single ‘Don’t Cry Africa’ which was shot in Botswana. This is her second single from her new debut album Ednah Sunrise with ‘Mamaland’ as the first single to be released. ‘Don’t Cry Africa’ is a song that advocates for unity amongst African nations for Africa is one, and it was shot beautifully in Mogobane in the southern part of Botswana. Mamaland video was shot in Zimbabwe and partly in Botswana because the artist has a strong connection with Botswana since this is where she was raised before she relocated to Germany for tertiary and later settling there. She has always been a song writer and sang in regional hip hop and gospel bands. She has also worked in musical theatres and has been featured as a soloist in the prominent musicals – We will Rock You, King of the Lions, Mama Mia and Dance of the Vampires. Her music is a mix of RnB, pop and reggae combined with African sounds and Spanish elements as she works with the German Indonesian Producer Orchidan Warwoka. She said that through her music she encourages people to fight injustice and corruption. “I feel like it is my calling to ensure a better life for the inhabitants of some in poverty stricken or war torn African countries,” she said. Micah Meshack has recently released a single titled ‘Bapa Le Nna’ featuring HT Tautona. The song is quite impressive having been produced by Phil Mate, composed by Micah himself with additional words by Matthews Matsetse and vocals by Liefy Jones and Matsetse. The romantic song starts with great vocals with the honeyed voice of Micah taking it into an RnB dreamy level where he sings about getting closer to his lover, hence the title ‘Bapa le Nna’. He shows his vocal ability with the song and blends it perfectly well with those of the eloquent vocalists that he included. The inclusion of the rap verse by HT Tautona makes the song very graceful, adding to the song contemporary and urban flair. It can definitely be listened to by anyone regardless of the genre that they prefer. It can be jammed to by lovers, and can make someone emotional because of the smoothness and gentleness that is in the song. With many Batswana now warming up to a mix of Setswana romantic songs it can definitely be a hit.